Great location nearby lots of tourist sites and the train station which was perfect after getting the bus from the airport. The staff couldn’t have been friendlier and more accommodating who were always helpful. They had lots of handy tips about where to go and answered all of my questions. 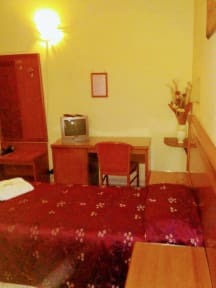 Room was spacious for a single and very cheap, great value for money and the bed was very comfortable. Lovely hostel and I would definitely stay again. This hostel has a good location - many sites are in walking distance, and even though it´´´ lies in the Termini-region, we never felt unsafe. The bathrooms (there are 2 for 3 rooms) are a bit run down, but are being cleaned every day. Breakfast is very poor: we even did not get any coffee - and I had booked this option just for the coffee: the landlady claimed there was no kitchen, even though she did have one in the other part of the hostel next house (what about an electric water kettle?). The hostel room was up many flights of stairs although the hostel staff helped me carry my bags up. You will need cash to pay. 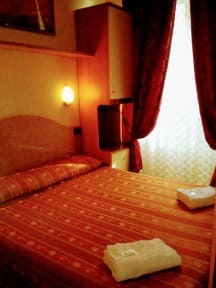 The hostel is close to Roma Termini. No kitchen facilities. No Wi-Fi and reception for personal cellphone reception is very bad. Bathrooms we're not clean at all. It's alright if you want to be fairly close to Termini Station and just staying for one night. Don't expect anything charming/special! The rooms are very plain, it's not a nice street, but fairly central. There's no common area and thus no atmosphere! Not sure it qualifies as a hostel. The guy who gave us the keys was helpful though. So turned out this hostel runs another hostel but not in the same building. We were located into another building which was old and pretty much unmaintained. The worst thing was they didn't provide a single elevator since it took lot of work to climb the stairs to 4th floor, it was insanely ridiculous for us since we brought 1 large luggage. Another minus factor staying there that you will pretty much live in an exiled place since they also don't provide a wifi connection. Cannot recommend the place: It is a flat with 4 rooms (what is the definition of a hostel ? ) . Ours was pretty run down and not very clean as where the bathrooms. Breakfast consists of a supermarket ban and a tetra pak juice. No hostel wlan. The place, the area and the person that welcomed us were dodgy. The self description of the hostel is deceiving... We finaly decided to leave not long after our arrival and had to find somewhere else to stay.